Early every spring as I drive into town I notice that people have erupted from their houses and are out on their lawns. But, instead of enjoying the balmy air, they stand with their heads bowed, holding little canisters of poison in their arms dutifully dribbling toxic chemicals onto the earth. The deadly compounds that they so easily distribute have the potential to endanger the life of all birds, bugs, plants, children and grown-ups that might inhale or otherwise consume them. We chance all that to kill the dandelion sprouts that dare to “yellow up” our lawns? I would like to dare these people to try something else and that is to just love the (edible, if not poisoned) dandelions. What is the worst thing that could happen? It seems that the world around me has been brainwashed into scorning dandelions on the lawn. Why must a yard be monochromatic? Why should everything that naturally comes up be wiped out and replaced with just one kind of grass? Who made up these rules? We are seeing that our world is confused about a number of things and I think that this disdain for dandelions is one of them. This lowly little flower is quite beautiful and is related to the larger sunflower. If dandelions were not free I believe that more of us would be ordering them from mail order catalogs and planting them in rows like marigolds. Letting dandelions and other wild plants grow is like having your own personal, renewable, sustainable food source erupting continually on your lawn. Hardy and full of life-giving energy, a great source of nutrients and minerals, wild plants have the potential to, once again, become very beneficial to us humans if we would just kneel down, have a good look and get to know them well enough to open our minds to their many uses. Instead we buy vitamins in plastic pill bottles, which add slime to the landfills when we throw the containers away, while we spray toxic chemicals on the free vitamins that would grow naturally right outside our door. I have often seen the same folk who have saturated their lawn with herbicides in the spring, later in the season, spraying their monochromatic lawn with precious water during a drought. This valuable water could surely be put to a better use than keeping up their prestigious lawns! It could be replenishing the food supply. In a world where insurance costs are skyrocketing, medical expenses are out of this world, transportation and food prices are continuously increasing, wouldn’t it make sense to go back to our roots and seek the forgotten food and medicinal value of the vitamin packed, herbs that yearn to grow, wild and free, at our feet? When I proposed this article to the editor of this website, Neil informed me that, “in Eastern Europe, lawns are almost unheard of and anyone who doesn’t live in an apartment plants their back yard fence-to-fence with fruits, flowers and vegetables.” Perhaps we should follow suit. Our so-called “local experts” are often part of the problem. I was appalled when glancing through a local newspaper last spring when I came upon an article by the Master Gardener Coordinator with the County Extension Office who recommended several applications of a post emergence, broadleaf, herbicide to get rid of wild violets and strongly suggested saturating the earth with a combination of broadleaf herbicides requiring the formulations 2,4-D, MCPP, diamba, MCPA, and 2,4-DP to control dandelions. Why? We sure have acquired some rigid attitudes towards what we consider the scandalous weeds that come up uninvited in everyone’s lawns. Why don’t we just change our attitudes? It is my belief that it will be the homestead type, the hobby farmers, the back- to-the-landers and all the wanna-bes (who really are, but don’t know it yet) who will be the ones to stand up, proclaim that the emperor is wearing no clothes, and be the children to the realization that dandelions and other wild plants are quite useful, practical and necessary, dressing up an otherwise naked lawn. My husband, who is a beekeeper, says that when he sets up to sell his honey the number one questions he is asked by interested customers is, “Where have all the bees gone?” or “Why are there no bees on my lawn anymore?” He will answer them with more questions, “ o you spray your lawn for weeds? Do you let the wild plantains, clovers and dandelions bloom?” Honeybees are not at all attracted to the golf course type lawn that many Americans think they have to uphold. Indeed, birds, butterflies and other wildlife cannot survive on our deserts of mown grass; they need native plants, shrubs, trees and a diverse variety of habitats and food sources to thrive and reproduce. 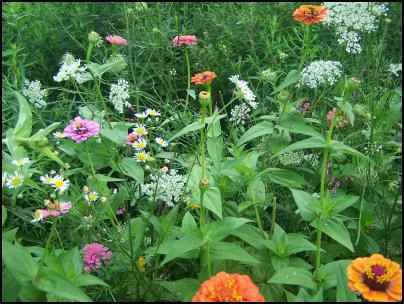 Growing wild plants on our lawns has the potential of saving each one of us a lot of money as we would have less need to mow and would have no need whatsoever to buy fertilizer, herbicides, pesticides or grass seed. Nor do we need to water a natural lawn as most wild plants are very drought resistant and hardy. I have a hard time even understanding what people see in plain green lawns. When I was a child, my parents would take us for Sunday afternoon drives around the countryside where I would glimpse, from the car window, plots of overgrown gardens that filled me with fascination. I wanted to jump right out and go exploring. Mulched, uniform, clipped, heavily controlled environments didn’t inspire my curiosity at all. I still see them as dull. The tangled yards, half domesticated and partly gone back to nature were the ones that tugged at my heart. Rustic cottages covered with wisteria and ivy looked quaint and homey to me. 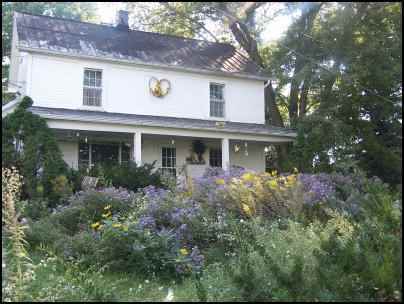 Overgrown side yards with native plants left to twine company with bulbs from Holland filled my need for mystery. To me a restrained, too orderly garden has no charm whatsoever. It embraces none of the unpredictable surprises that a little leeway can provide. When a plant comes up on our property that I do not recognize I am most inclined to just let it grow. Anticipation builds up inside of me as I wait for it to come into flower so that I can identify it in my field guides. I have been thrilled to discover, to name just a few, such plants as: flower-for-an-hour, self-heal, jack-in-the-pulpit, flowering dogwood, elderberries, poke weed and spring beauties coming up in my yard all on their own, perhaps with a little help from the birds. A relaxed approach to gardening certainly allows room for what I call Mother Nature’s plantings. At times she decides to seed hollyhocks in the strawberry patch, Queen Anne’s Lace with the zinnias or chicory alongside the sidewalk and who am I to disagree? You won’t see any mulch in my gardens either except on the paths. Everyone has their own idea of beauty, but a sea of grass with a few beds of mulch along the sides with a plant situated here and there is stark and unattractive to me and void of any enchantment. Some folks find my overgrown yard messy and unattractive but who must it please, me or them? According to me, the rest of the world is just way too uptight about yards. Our yard is my oasis, a refuge from the world of technicality, logic and order. Our lawn is a respite for myself and my feathered and furry friends. I say let there be unplanned blooms, private disclosures and never ending marvels. I need not to be in control; my main endeavor is to be in harmony with nature. My gardens speak to me of the inexplicability of The Creator and when I walk there I often feel Him walking along beside me. A naturalized lawn does not need to be completely natural. I have the most fun when I let the birds plant a little here, Mother Nature sow a bit there and I stick in some color where and when I get around to it. It is like having a whole team, each one of you with your own talents and contributions. Our lawn goes through a succession with the seasons, in early April the spring beauties and Dutch bulbs bloom alongside dandelions and wild purple violets. In June, the dame’s rocket naturalizes beside domestic daylilies and fairy roses. Come late summer, the goldenrod and New England asters dance beside sunflowers and hollyhocks. I would like to share some of my tried and true wild lawn plant recipes for your enjoyment. If you cannot identify the wild plants that will come up in a natural lawn seek out Park Rangers, naturalists, herbalists, friends and neighbors in the know to get you started and learn how to key out plants in a field guide. Early every spring a natural lawn will erupt with these vitamin packed plants. Be sure to collect only very young, under six-inch poke sprouts. All the other herbs must be collected long before they think about flowering or they will be bitter, especially the nettles who will be sure to let you know how bitter they are by stinging you! Dandelion greens are the best when they are as little as squirrel ears. Parboil the nettles and the poke sprouts for five minutes. Pour that water off then parboil again for five more minutes with some salt and pepper. Drain for the second time, set aside. Fry up the bacon then remove from the pan to crumble, put the drained poke sprouts and nettle along with the rest of the herbs into the pan of bacon drippings. Put the crumbled bacon back into the pan. Heat the whole mixture until the greens are tender, put a lid on the pan and let steam for a while. Then add the drops of vinegar, maybe a little sugar, and the chopped eggs. I will let you in on a secret that the world does not know. Do you know who does know? Kids know. Kids know that, what the world looks on as just invasive plants of lawns, the lowly dandelions, are really the keepers of the wings of wishes. Every child knows that if you blow on a dandelion puff and all of the fluff flies away, your wish will come true. “Thistle-down Angels” is what we used to call them. How did the world ever get so messed up that it can persuade us that anything as yellow, as cheerful, as independent and as inspirational as the flowers that make Thistle-down Angels can be something to despise? Other flowers, when in the vicinity of dandelions, bloom sooner then they would if a dandelion was not near. It is true, I read it someplace scientific, unless a Thistle-down Angel whispered it into my ear. So, despite the attitude of the world, I will have dandelions strewn throughout my lawn, making their bold statement of vitality. 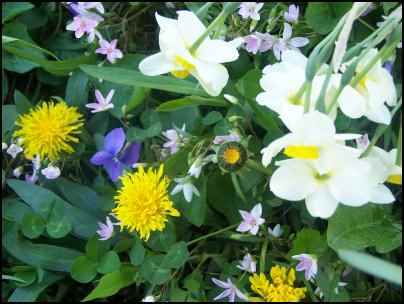 In the spring our two acre lawn is a mix of naturalized spring beauties and wild purple and yellow violets. Red clovers mix in with the spring bulbs and perennials that we have planted alongside bluebells, narcissus, tulips and lilies-of-the-valley. I think that the yellow dandelions harmonize delightfully with all the other flowers. They give a spark to the overall tapestry with their laughing shade of yellow. Have you noticed what flower the bee prefers? Now a bee should be an expert about flowers and which ones are the most important, after all she makes her living from knowing flowers. The honeybee could tell us that the misunderstood dandelion is a very valuable herb. In a world of sick people, we are killing the plants that could help us heal. It is even written in the dandelion’s Latin name: Taraxacum officinale. Officinale is an old word that means a medicinal herb sold officially in an apothecary shop or at the market place. There was a time, before we forgot, when the dandelion was greatly appreciated and sought after. Every part of this beautiful plant can be harvested for food and medicine. The fresh green leaves can be used in cooking; they are jam packed with Vitamins A and C and contain valuable potassium and minerals. The blossoms can be fried or made into a tea. Dandelion-root tea can help wash out toxins in the human system while strengthening the liver. Dandelion-Ade is very refreshing, iced, on a hot spring day after a good workout under the sun. If you or any of the children get too much sun on your face or arms cold dandelion tea is very cool and healing when splashed onto the skin. Send out the children to gather as many unsprayed, bright, new Dandelion faces (blooms), that they can gather in their skirts or baskets. Meanwhile, get a large big pot of water boiling and have a large bowl ready. Pick and wash through the dandelion faces for grass, straw or any stray bugs. Place the Dandelion faces into the bowl and stand back as you pour the boiling water over them. Cover, let sit 15 minutes. Remove cover and let dandelion faces remain infused while you let mixture cool. Strain the brew into a pitcher. Add ice, honey or sugar and lemon to taste. Collect a basket of wild violet flowers. Place flowers in a large ceramic bowl and pour 2 cups of boiling water over them, let this infusion steep all night. The next day strain into a saucepan, this is the fun part: watching the color of the water turn from a dark blue into a light purple color. Put this pan of liquid to boil with one package of fruit pectin, stirring constantly until all the pectin is dissolved. Boil for one minute, add 4 cups of sugar, stirring until the sugar is dissolved, boil for one more minute, pour into hot sterilized jelly jars and process in a hot-water bath for 15 minutes. This plant is a jewel of a weed. The Native Americans knew of its uses and thus were not afraid of poison ivy. Jewelweed has juice in its stem, much like the gel of the aloe vera plant which is useful for burns. Jewelweed gel can be spread on the skin that has been exposed to poison ivy before or after the blisters start to form, to neutralize poison ivy’s oily sap. The jewel can also be used to lessen the sting of nettle and insect bites and to aid in the cure of rashes, warts and eczema. It is related to the annual impatiens flower that we buy from the green houses in flats to take home and brighten up the shady corners of our yards in the summer. Indeed this precious weed carries the Latin name of Impatiens. It comes in two varieties, one with a yellow flower (Impatiens paddida) and one with orange flowers (Impatiens capensis). The common name of jewel weed did not come from the fact that it is a jewel, as I would cause you to believe, but because it has a way of holding water on its leaves so that the droplets stand up and look very much like diamonds, reflecting and sparkling back to the sun. 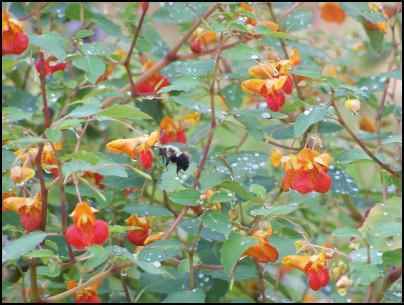 Jewelweed is very attractive to hummingbirds and butterflies. 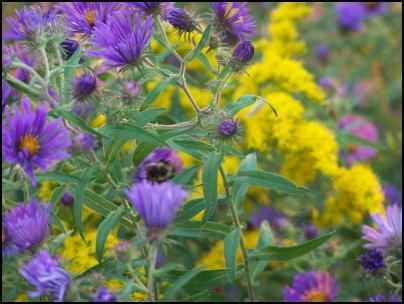 Carpenter, bumble and orchard bees are its prime pollinators and it is a native plant of the Americas. Other common names for this valuable specimen are touch-me-not and snap-weed, as the ripe seedpods are spring-loaded and pop open at the slightest touch with a definite snapping sound. If you find that you have rubbed up against poison ivy or you feel the familiar itch start to tingle on your skin, look around, jewelweed will most likely be near as it often grows right alongside poison ivy. Thriving in creek beds, beside streams and in any cool, moist, shady place or in the un-mown ditch behind your house, growing in colonies to about waist height. Break open the stem and rub its substance on the affected skin. If you have already broken out in blisters, gather plenty of jewelweed and keep applying the juice of its stems every time you feel the urge to scratch. A tea brewed from the stems and poured into ice cube trays is handy to have around for emergencies, like when a friend of mine developed a poison ivy rash after the jewel weed had all died back last fall. Jewel weed does all this magic without the unpleasant side effects of medicines such as steroids or cortisone that are commonly prescribed for poison ivy rashes. After all, it is whole and unadulterated, just naturally wonderful.